Founded in 1995 by a group of students, faculty, staff and alumni, the Kelly Writers House is an actual 13-room house at 3805 Locust Walk on Penn's campus that serves as a center for writers of all kinds from Penn and the Philadelphia region at large. Each semester the Writers House hosts approximately 150 public programs and projects--poetry readings, film screenings, seminars, web magazines, lectures, dinners, radio broadcasts, workshops, art exhibits, and musical performances--and about 500 people visit the House each week. They work, write, and collaborate in seminar rooms, a publications room, the "hub" office, a cozy living room, a dining room, a kitchen with plenty of space for conversation, and "the Arts Cafe," the wonderfully open south-facing room that was originally the parlor. Writers House also has a strong virtual presence. Our ongoing interactive webcasts give listeners from across the country the opportunity to talk with writers such as Ian Frazier, Richard Ford, and Cynthia Ozick. And via our dozens of listservs and email discussion groups, we link writers and readers from across the country and around the world. Through its many programs and projects, the Writers House promotes the full range of contemporary literature, addressing writing both as a practice and as an object of study. 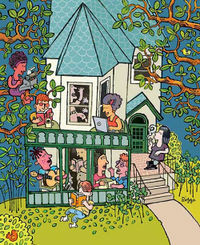 The intrepid band of students, faculty and Penn staff who formed the Writers House in the fall of 1995 were committed to a form of literary communitarianism. The mission statement they wrote--it's really a declaration of academic independence--expresses this idealism. So far as we know, there is no other facility like the Kelly Writers House anywhere. This page was last edited on 23 November 2016, at 10:58.